I uniquely provide custom prints based on location and size, because let’s face it: not everyone has the same special places, and everyone’s home is different! LOCATION. I know everyone has special places of their own. If your special place isn’t in my portfolio yet, we can arrange to have me photograph it and provide you with that truly personalized fine art print to hang in your home. SIZE. You’ll find a number of options for each of my prints, but you may need a slightly different size to perfectly fit that spot you have picked out. While the overall aspect ratio never changes, I can easily accomodate different size requests to make sure the print fits like a glove right where you want to hang it. Prints are available in two formats: ready to hang, or print only. Regardless of size or finish, each print is personally inspected prior to shipping to ensure it adheres to my quality standards. I have partnered with a highly experienced and reputable local print lab to produce all of my larger sized prints for a perfect, ultra modern look that is ready to hang in your home. Printing the image onto fine art paper (Arches smooth) prior to mounting to metal. This is uniquely different than other Dibond prints you may encounter, and is better suited for archival purposes. Securely attaching a hidden Nielsen frame to the back of the aluminum, which gives the appearance of the print ‘floating’ ~1” off the wall. Protecting the print (UV and more) via an invisible, matte, velvet film, making it safe for gentle wipe-down cleaning, even minor water spills. See photo highlighting this ready to hang finish in a client’s home. Sleek, modern, and for the ages. 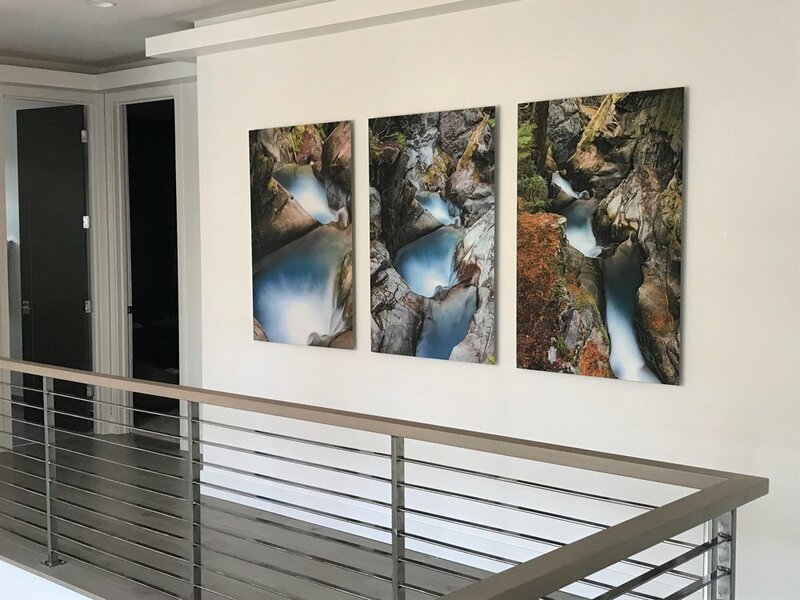 Three 30”x45” DiBond prints with protective coating and ‘floating’ Nielsen frames. Smaller sized prints are created by me personally on fine art paper, leaving you all of the options on how you’d like to mount them. I exclusively use Canson Infinity Rag Photographique 310 gsm paper. 100% Rag, Ultra Smooth, Pure White. This provides a high quality, matte like finish which I’ve found best for my images. Limited edition prints are restricted to 10 prints per available size/finish combination, unless otherwise noted (with custom sizes deducted from the closest dimensioned edition run). Size options are never altered or added after initial for sale posting.